Acer is performing quite well in the notebook PC market. Currently, it has the largest share of the Russian market, and it is also faring well worldwide. Much of Acer's success can be attributed to its powerful marketing efforts and unique pricing. Acer manages to win a large share of the laptop market largely by selling uber-cheap notebook models that feature everything necessary for work. This ultra-portable notebook model we are reviewing today that comes with a wide 12" display, however, is not very cheap. It is a business model that comes at a business price. The ultra-portable class of notebook PCs is gradually becoming more popular, as there appears to be more business users who need notebooks for constant short-term trips, where a small notebook and light weight play an important role. Although this class of notebook PCs is growing, the sales volume of ultra-portable notebooks is still far from the sales of regular notebook classes. The Acer TravelMate 3040 is designed in alignment with Acer's ambition to balance high-performance ultraportability and superior efficiency by creating the ultimate lightweight notebook for highly-mobile business professionals. Weighing just around 1.5kgs and featuring the latest 64bit Intel Centrino 2 Duo Mobile Technology, the Acer TravelMate 3040 offers maximum productivity, superior unwired freedom and ultra-connectivity to drive your business mobility into the future. As we can see, the company highlights the combination of ultra-portability and high performance. Unfortunately, it is not possible to go from the model catalog page directly to technical support. You have to instead use the menu. The first page of the tech support web site is devoted to the warranty. It says that the warranty is valid only if you have a warranty coupon. Otherwise, the warranty will be up to your retailer. 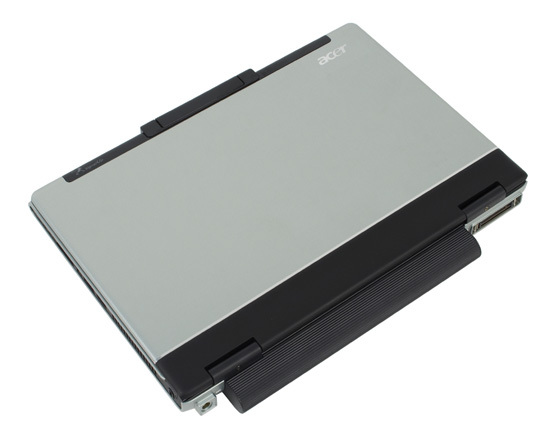 This page describes warranty peculiarities for Acer Ferrari notebooks. All Travelmate models come with a two-year warranty. The international warranty is not described well, though. In addition, the website doesn't offer complete information on what you must do in the case that your notebook is broken. The process of downloading drivers is not very good in our opinion. First you choose your notebook model in the list. On the next page, you choose the necessary driver from the drop-down menu. Then a window pops up with a download link. There are three links, one for XP Drivers, Vista Drivers, and Acer Utilities. The process seems easy enough, but the problem is it is difficult to tell whether you even need to download a new driver because no driver version is listed. However, for advanced users direct FTP links to the drivers and utilities should cancel out the above inconveniences. We should also mention that the bundle does not include a Recovery CD. A recovery image is stored on the hard drive, and the built-in utility suggests that you burn the image to a compact disc at startup. The company has started including an empty recordable compact disc into the bundle, this was users can create a recovery CD without having to buy a spindle of blanks CDs. There is also an external drive, which can be connected to the IEEE1394 port, as well as an external VoIP phone. Mobile Mark 2005 failed to start under Windows Vista, and so we tested the notebook in the reading mode (we opened a book in a reader) and in the video playback mode (playing a DivX movie repeatedly). Windows Vista automatically turned the notebook off at 4% charge. We ran the tests with both batteries - one of which is 22000mWh and the other 44000mWh capacity. Interestingly, the difference in battery life is almost exactly proportional to the difference in battery capacities. We forgot to disable WiFi several times, so the notebook started to search the network from time to time. Despite this, when we re-ran the test, there was almost no difference in battery life - to within 3-4 minutes. The notebook runs on batteries long enough, but it does not break any records. Our attempts to change the power consumption scheme in the Acer settings did not change its battery life. The wide panel used in this notebook significantly changes the layout of the device - the notebook becomes wider and shorter because of it. This added width, however, creates more room for the keyboard. The keys are wider and more ergonomic (unfortunately, not all manufacturers use this opportunity - they install standard keyboards). The wrist pads, though, are smaller now, meaning your palms may slip off the notebook from time to time. The keyboard of this notebook is a compromise layout. The left part is very convenient and easy to use, even for touch typing. We should also mention that the ctrl key is in the corner, which is more convenient for touch typing (just like in desktop keyboards). The only complaint we have with the right part is the two narrow buttons in the middle and upper row, and one narrow button in the bottom row. So it's rather inconvenient for touch typing. But even if you watch as you type, it's still more difficult to hit the narrow buttons. In our opinion, the layout of ins/home group of keys above the cursor buttons is close to perfect: the ins/del buttons are located in the upper part of the keyboard. Del is in the corner, so it's very easy to find this button as you type. Tge "gup" and "pgdn" keys are near the cursor keys. It's convenient to use them when you read text, primarily because these buttons are near the cursor keys and allow for easily scrolling down pages. The problem is, from time to time you may end up pressing the wrong key (pgup or pgdn instead of left or right), because these buttons are twice as high). The Home and end buttons work only while Fn is being pressed. To be honest, though, it's hard for manufacturers to come up with a different solution with this keyboard's dimensions. We'd like to mention that the keyboard is also narrow. There is, however, stil enough room around it- over a centimeter at each side. A redesigned keyboard might have allowed to avoid using narrow keys (important keys). 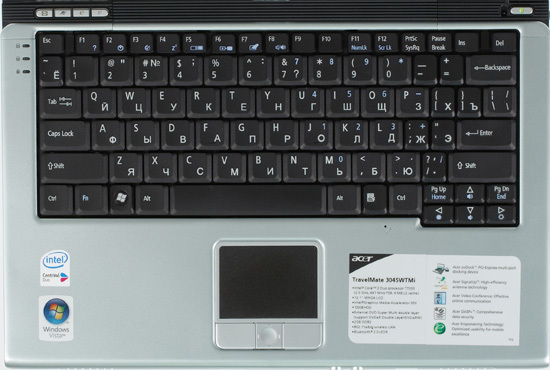 All Acer keyboards have similar tactile feedback. They are notable for quiet plastic-like "chatter" as you type. The keys also take a certain effort to press. You won't accidentally press a wrong key by just resting a finger on it. The keyboard is fixed well in the notebook. Only the middle of the keyboard bends slightly when typing and slightly bounces back when pressed. For the most part, we approve of this keyboard. We do, however, feel that fingers may get tired from typing too much on it because the buttons are rather hard to press. The touchpad is small and almost always hot. This is a result of the internal design of the notebook. The touchpad works well and has good default settings for sensitivity and speed. The largest complaint with the touchpad is that its buttons are hard. The left and right buttons are very hard and when pressed give off a very audible click. On the bright side, the touchpad has a four-way scroll button. The problem with the scroll button, is that it's very small and so if you have bigger hands you may experience some problems when using it. Even though the notebook case is small, Acer engineers have found enough room for four additional function buttons. These buttons though are very small making them easy to miss. 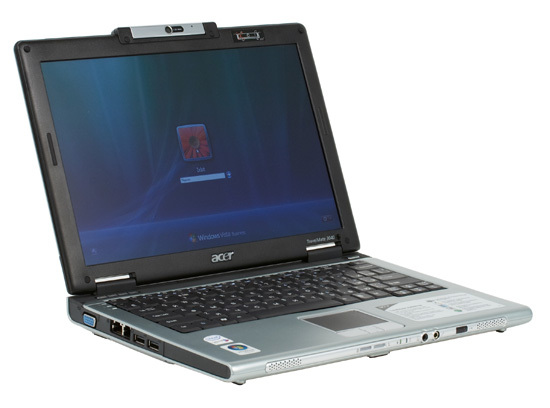 Traditionally for Acer, three buttons are used to start an email client, a browser, and Acer utilities (you can choose a power profile and connect to a wireless network). By default, the fourth button starts a utility to configure these buttons. In our opinion, it is an elegant and convenient solution. The "Fn" combinations are also well thought-out and convenient. For example, Fn+F1 shows help on hot keys. Fn+F2 calls the config utility from Acer. Fn +F3 starts the power configuration utility. Fn +F4 puts the notebook to sleep. Fn +F5 switches video output between the built-in and an external displays. Fn+F6 allows users to switch the backlight off to save the battery - the backlight will be back on when you press any key. Interestingly, the image stays on the display and only the backlight is off. F7 and F8 disable touchpad and sound correspondingly. Brightness and volume control is assigned to cursor keys. The indicators are divided into two groups. The first group is indicators on the front panel of the keyboard. Here we can see the following LEDs: power (green - on, orange - sleep), battery (green - charged, orange - discharged or charging. The LED is off, when you work in the battery mode). There are also two big buttons there - Bluetooth and Wi-Fi. If the interface is disabled, the buttons do not light up. The buttons blink red when the notebook is searching for a network, and light up when connected. This function is quite conventient. What we don't like is that when disabled, Wi-Fi automatically activates when switching from battery to AC power or vice-versa; this means that the wi-fi automatically starts searching for a network. You have to deactivate it manually, if you don't need Wi-Fi at that specific moment. You can disable or enable the interface in Acer power profile, but this isn't the most conventient way of closing Wi-Fi. The interface should remember its state regardless of power supply. The second group is three indicators to the left of the keyboard. They are responsible for scroll and numlock (the latter is much more important), as well as HDD activity. We've stressed many times that cheap notebooks from Acer end up looking rather decent. This notebook, though, is more expensive. Although it has the same style, it looks excellent. First of all, it uses the winning combination of black and silver colors for its case. In addition, the materials of both colors are high quality. Note that the display lid is not smooth, and it has a relief meaning it will most likely hide scratches and abrasions. The design of the notebook also produces a nice impression. The combination of black and silver-gray looks very nice. We don't like the traditional curved front edge of many notebooks, although it's a matter of personal preference. The sides are black with silver edges, which gives the notebook an attractive appearance and makes it visually slimmer. The case's ergonomics are also up to the mark. For example, it's convenient to carry the notebook like a folder, holding it by the bottom edge. The battery has a ribbed case, its bottom is made of antislip black plastic that does not show dirt. Let's have a look at the layout of ports. The front panel houses the speakers. Between the speakers we can see (from left to right) Bluetooth and Wi-Fi buttons, power and battery LEDs, audio jacks (headphones-out and mic-in). 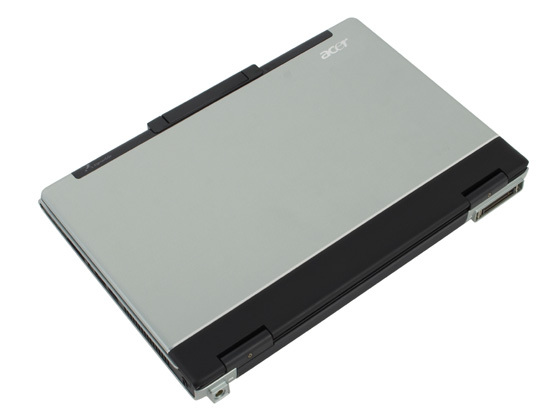 The right side of the notebook features a PCMCIA slot, a card reader, USB, IEEE1394 (it's used to connect an external optical drive), and the exhaust port of the ventilation system. The battery covers the rear panel almost completely. Nevertheless, there is some room left for a power connector at one end and a dock connector at the other. If you work without many peripheral devices, there will be no wires around the notebook. And finally, the left side of the notebook features a VGA port, a modem/LAN port, and two USB ports. On the whole, the notebook is quite convenient. There are no major problems, at least from our viewpoint, with its ergonomics. Ultra-portable notebooks usually don't come with the best of multimedia features. The 3045 model is not an exception. The display is good for work, but its contrast is too low for video playback. The other characteristics are standard for this class of devices, and the notebook features nothing special. Its viewing angle is quite small, and the maximum brightness is also not very high. The same concerns the audio system - you shouldn't expect much from it. Its built-in speakers barely work well with movies. They may be too quiet for a noisy room, and you should keep in mind their distortions. The situation with noise and especially with heating is not peachy either. The problem is evidently in the ultra-slim dimensions of this notebook with a powerful hot processor.The small dimensions generates extra load on the cooling system, meaning the CPU fan snaps into action quite frequently. The fan action is required, as the notebook frequently gets noticeably hot. The bottom, the fore part of the keyboard panel, the wrist pads, and especially the touchpad get quite hot after an hour of work. This poses a problem if you are using the laptop on your lap. The software bundle includes all standard utilities from Acer, which will be reviewed in another article. It's an imposing bundle - a password manager, a backup utility, power management utilities, wireless network utilities, etc. Acer also introduced the utility to monitor shock and vibration for HDD heads. There is also an easy-to-use utility Orbicam, which controls the built-in web camera. Most importantly, the notebook comes with Microsoft Windows Vista. This operating system looks really good, but its complexity has grown in geometric progression. First of all , there are compatibility problems with Mobilemark 2005 under this operating system. Second, it's much more difficult to configure power options than in Windows XP, because the options are hidden in the depth of nested menus (at least three levels deep). In our opinion, Windows XP is much more convenient. As usual, developers simplify things for inexperienced users, and make it much more complex for advanced users. And finally, you cannot configure the notebook to turn off when the battery is fully discharged. It always turns off at 4%. We'd like to note that the hard drive spins for a long time (this notebook worked as a test system most of the time). The system failed to detect the optical drive from time to time. At startup, of course. The trick with "find new hardware" did not work here. The keyboard is convenient. You can type without much damage to your fingers and peace of mind. We like the on-screen notifications, when you press buttons (for example, to enable the wireless interface). The notebook comes with a Supermulti external optical drive in the same black-and-silver style. The drive looks stylish and is connected to the IEEE 1394 port instead of USB. The second interesting bonus is an IP phone. It's very convenient - the phone is designed in the form of a PCMCIA card, which can be stored in the corresponding slot inside the notebook. So you can carry the phone everywhere. It communicates with the notebook via Bluetooth. The phone is powered by a CR2032 battery. The notebook is evidently intended to be used mostly for travel. 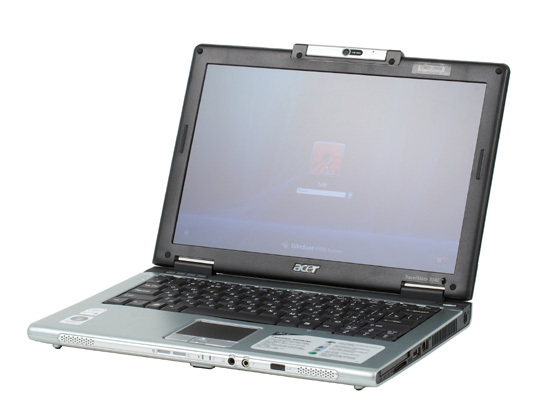 Acer has given most of its attention to the notebook's weight, dimensions, and attractive appearance. The notebook should please users who travel frequently, both short-term (for example, a short trip for business negotiations), when even a small battery will be enough, and long-term (for example, on business trips, when you will need a large battery or both). Nevertheless, this notebook is an addition to a desktop computer rather than an entire replacement. Keeping its intended use in mind, we are surprised that the laptop is equipped with a powerful processor from Intel, especially as it comes with integrated graphics. This CPU is not always used to its full extent, and it gets hot in the ultra-slim case. Such a notebook could have used a less powerful processor with lower power consumption. We are not sure that this notebook will be regarded as an image model. Nevertheless, we repeat that the 3045 has a very attractive design. It's a small, nice-looking, functional, and most importantly, light-weight notebook with an extra battery and IP phone in the bundle. For the most part, this notebook would suit frequent travellers who need to bring a notebook PC with them. 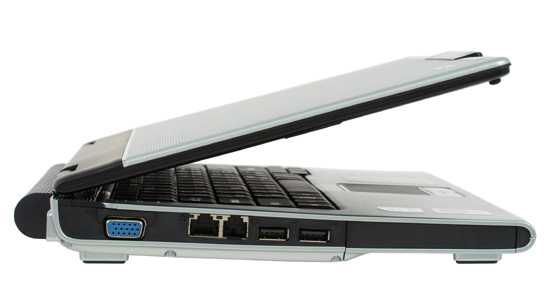 Its low weight, attractive design, powerful processor, and ip phone makes it an idea notebook for business users. We express our thanks to Acer Russia for the provided notebook.